Whether you’re a runner, other athlete, or you just want to make it through your day pain-free, it’s important to take care of your body to keep it healthy and free of any injuries. But, staying injury-free is often easier said than done. A majority of runners will wind up getting some sort of injury each year, whether it just makes them take a day or two off from running or it sidelines them for weeks or months. Luckily, many of those injuries can be prevented. One great way to help reduce your injury risk is to keep the muscles in your body balanced. You’re able to move your body because you have muscles that move in opposition to each other. For example, when you contract your quadriceps, the muscles on the top of your thigh, you can extend your leg at the knee joint. When you contract your hamstrings, the muscles on the back of your thigh, you bend your leg at the knee joint. Your quadriceps and hamstrings are antagonistic muscle groups — they work against each other to move your leg in opposite directions. You’ll find these antagonistic muscles throughout your body. It’s what allows you to more your body back and forth instead of back without a forth. Antagonistic muscles are what allow us to run, pick things up and set them down, and do pretty much everything you do every single day. They’re ultimately what allow us to move throughout our environments. How does muscle imbalance lead to injuries? When the antagonistic muscles in your body become imbalanced, problems happen. Let’s take the example of your quadriceps and hamstrings. If your quadriceps are a lot stronger than your hamstrings, as you walk or run, you’re going to pull your leg forward and extend your knee much more forcefully than you can pull it back and bend it. You’re pulling too much in one direction and not enough in the other. The uneven stress on your hip and knee joints caused by the muscle imbalance can easily lead to injuries. The same is true if one set of muscles is much more flexible than its antagonist. The tight muscles will keep pulling and pulling on the joints they’re attached to like a thick rubber band. If the antagonistic muscle is much more flexible, it may allow the tight muscle to pull that joint or part of your body out of alignment. The tight muscle winds up acting like a much stronger muscle, putting extra stress on the body that can lead to injury. Another way to think of this is to consider uneven wear and tear on the objects around us. Imagine a tree in the middle of a field. You’ll see its branches waving back and forth as they naturally pull back to their starting point. But, if you pull the branch down repeatedly, or if you pull it down too forcefully, that branch will break. You will have exerted too much force in one direction, and that force eventually causes the branch to snap. How can yoga help with muscle balance? 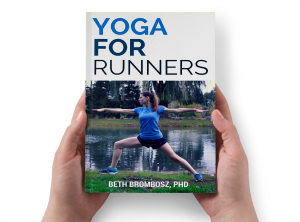 I absolutely love yoga for runners and other athletes because it’s a great way to even out muscle imbalances. A good yoga teacher will lead you through a sequence of poses that work your body to even it out. 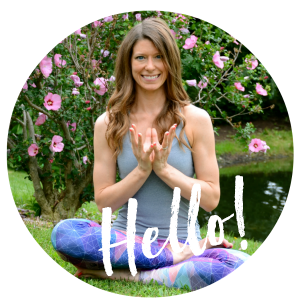 For each pose that really strengthens or stretches one area of the body, your teacher will lead you through a counter pose to address the antagonistic muscles. For example, after doing a big backbend that compresses the spine and back muscles, your teacher will often lead you to decompress and lengthen your back in a pose like Child’s Pose. A well-rounded yoga sequence and practice will make sure you put equal emphasis on strengthening and lengthening antagonistic muscles. For example, I know runners love to stretch their outer hips and glutes. When I teach yoga classes to runners, or when runners sign up for my Yoga for Runners Program, I lead them through plenty of those outer hip openers that they love. But, I also make sure to lead them through yoga poses that open the inner hips. Otherwise, they can wind up with hip and knee injuries if their outer hips and glutes are too loose and their inner hips muscles (the hip adductors) are too tight. Balancing your body and your muscles with yoga can be easier than it seems. What it really requires is either a good instructor to lead you through poses that strengthen and loosen your body equally, or you’ll need to do a little research to learn what poses work each part of the body. A quick Google search can also help you find poses that either strengthen or lengthen different muscle groups. You’ll naturally feel how the poses work your body as you practice them, either feeling “the burn” if you’re working a particular muscle group, or feeling the gentle stretch as you work to open your body. If you only practice at home, try keeping a journal or a notebook where you jot down your favorite poses and where you feel them in your body. It will help you get more in tune with the signals your body sends you (which is so important for injury prevention!). And, it will help you come up with a list of poses and counter poses that you can use to keep your body balanced.